KNOLSKAPE, a leading provider of talent transformation solutions for the modern workplace, is proud to announce another milestone for the company. 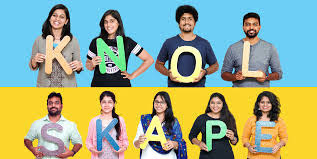 Committed to service the growing learning needs of the world’s largest corporates, KNOLSKAPE announces the expansion of their solutions consulting team across their offices in Singapore, Kuala Lumpur, Bangalore, Delhi and Mumbai. The expanded team includes five key hires, who come with diverse corporate experience, and have worked with some of the largest corporations in various industries, across the globe. Collectively, the team comes with experience in human resource management and consulting, strategic HR and Leadership, capability development, succession planning, organizational culture and climate, workplace assessment, facilitation, psychometric testing and assessment, statistical modelling, and program evaluation. This team’s growth is well matched with KNOLSKAPE ‘exponential global expansion planned in the year 2018-2019. Investing resources in expanding the global solutions consulting team will allow KNOLSKAPE to better anticipate learning needs of organizations across the globe and deliver learning solutions to support just-in-time, accelerated results for capability development, preparing global workforces for the Digital Age. “KNOLSKAPE has always believed in personalized and accelerated learning, and customer needs are growing; to ensure that we continue to provide the same experience for all our customers as we focus on exponential business growth at a global level, having the right team is important. I am very excited about ournew regime, because they possess a diverse mix of capabilities, and are already adding tremendous value to our clients,” states Rajiv Jayaraman, Founder and CEO at KNOLSKAPE.